Pieced and appliquéd cotton quilt in flower basket pattern. Design features 32 flower baskets set in staggered rows, alternating with elaborately quilted white blocks. Baskets are pieced of red and orange triangles, and have appliquéd handles. Issuing from the top of each basket are three appliquéd tulips. Narrow appliquéd vine border on three sides. Green binding, white backing, and cotton batting. 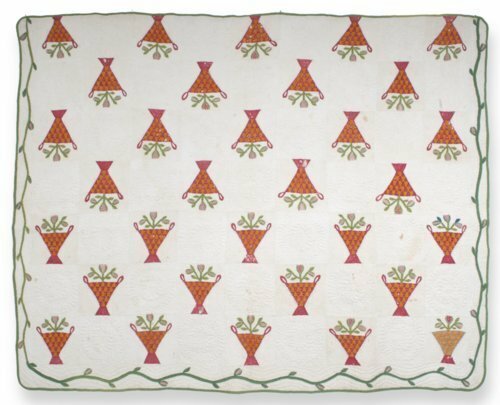 This quilt was probably made by Samantha Monroe Stanton (1845-1908) in Tennessee around the time of her marriage to William Stanton in 1865. The Stantons settled in Kincaid, Kansas, after the Civil War.